For some crazy-busy people, coffee in liquid form is a tough pill to swallow. If you’ve ever spilled the stain-causing stuff on your lap while driving in a mad rush to work, you know what we mean. Or if you’ve ever splashed your child’s head with scalding java (I unfortunately have) while pushing that precious cargo in a stroller, you feel our pain. Tasty and comforting as they may be, fresh-brewed coffee fixes can be time-sucking inconveniences. They’re expensive to shell out for on the go, too. Basically, drinking your coffee can be a real pain. Perhaps it’s better to eat it in chewable form (after accepting that your schedule has spun out of control). It's all the buzz, without the fuss. 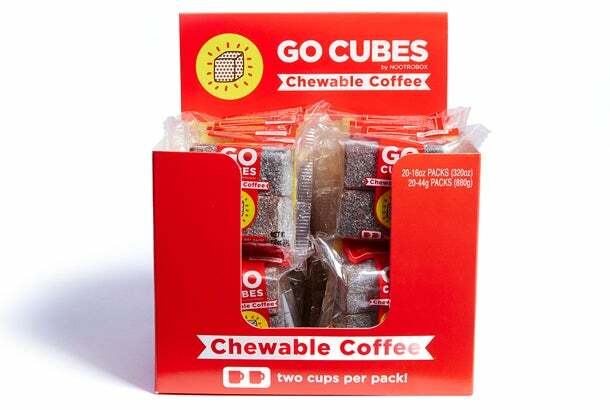 At least that’s the premise behind Go Cubes, the bite-sized chewable caffeine shots we recently told you about. The soft, square gummies are made with condensed cold-brewed coffee, along with some sugar and glucose syrup to cut the bitterness. The little blocks are produced by Andreessen Horowitz-backed Nootrobox, a San Francisco “biohacking and human enhancement” startup that cooks up a variety of edible nootropics, so-called “smart drugs” designed to enhance the eater’s mental state. To date, more than 1 million Go Cubes have been purchased. That’s a lot of chewable, gelatinized caffeination buzzification. Software engineer Geoffrey Woo, Nootropics co-founder and CEO, told Entrepreneur that the idea for them was born out of “an obsession with how to enhance human performance.” He caught the biohacking bug at the same time as his fellow software engineer co-founder Michael Brandt, back when they were students at Stanford University. Not only did Woo and Brandt “hack” coffee to be more portable since launching Nootrobox in 2014, they also made it measurably more precise in terms of exactly how much caffeine it contains. “Think about it, when you drink from a barista, from a drip pot or from a French press, who knows how much caffeine you’re taking in?” he says. “You don’t actually know.” Consuming too much caffeine can potentially overstimulate your system and lower your cognitive function overall, he points out. No bueno for the body and the mind. That’s where Go Cubes come to the rescue, or so Woo hopes. To see if they stand up to his claims, the staff of Entrepreneur's office in Irvine, Calif., gave these bad daddies a try. We took notes on their flavor and texture, and on whether they produced the physical and mental effects Woo says they do. Mind you, we’re not scientists. We are, however, certifiably busy and tired. 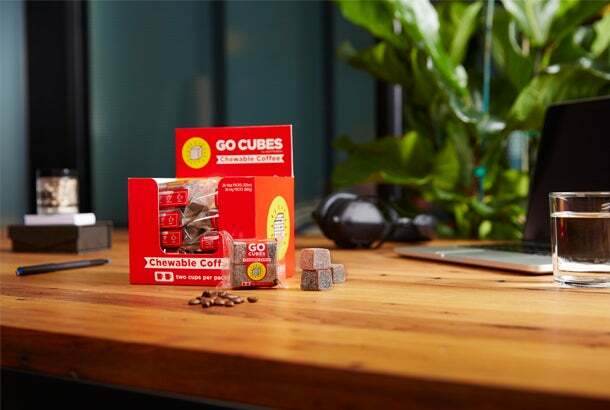 So do Nootrobox’s clever caffeinated cubes, available online in packs of four (and priced at $59 for 20 four-packs), actually taste like cold-brewed coffee? Do they really “enhance focus and clarity”? Eagerly signing up as the first guinea pig, I downed a whole four-pack of Go Cubes, which is equivalent to two cups of coffee. Apparently, three flavors come in a pack -- “pure drip,” “mocha” and “latte” -- though I couldn’t tell them apart, as they’re not individually flavor-labeled and only slightly vary in brown hue. I tasted them three separate times, all while previously uncaffeinated -- including an hour before writing this article. They tasted better than I thought they would, hitting my tongue at first with a bold but sweet dark roast coffee flavor. The aftertaste was more bitter than the initial sugary bite, lingering in my mouth for an hour or more, right up until I felt the need to brush my teeth and gargle with mouthwash. A piece of gum wouldn’t touch the level of coffee breath left behind. In terms of texture, I found that Go Cubes were less sticky than Dots gumdrops and Swedish fish, yet equally as firm, easily giving way when I sank my front teeth into them. I was pleasantly surprised that they didn’t get stuck to the grooves of my back teeth as I chewed. They went down easy. Effect-wise, I detected a fully jacked caffeine rush a half-hour after popping a pair, about as potent a jolt as I’d clock from my typical two back-to-back cups of homemade French Roast brew. My heart pounded and my hands trembled. As for increased mental clarity, I don’t think I experienced any, though how would a layperson really measure such an effect? Besides, I was too distracted by my shaky fingers and feeling like I was vibrating from the inside out to really focus. The vast majority of the responses we've seen have been positive. 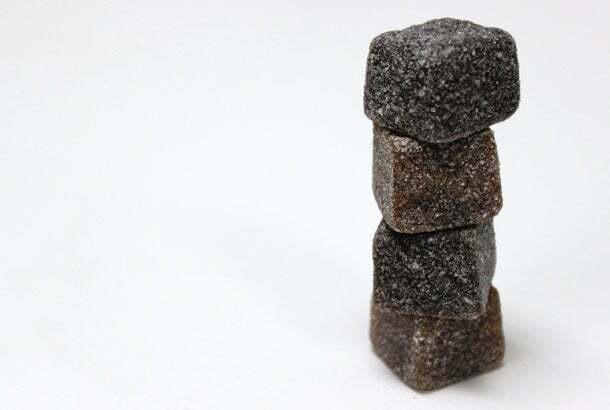 But, like the taste of coffee itself, the flavor profile of Go Cubes can be polarizing. It's intense because each cube’s got a half a cup of coffee plus other nootropics concentrated into each cube for performance. We aren't a candy! I personally like the jelly-like texture as it's a unique mouthfeel to a unique product. In terms of performance, not 'feeling' GO CUBES is a new one I've heard. If someone is a four-plus-cup-of-coffee-a-day [drinker] or [they’re] someone with low sensitivity to caffeine, I'd recommend trying more than two cubes … folks can dial up or down their specific intake depending on their own preferences. From different viewpoints, creator and eater, there you have Go Cubes in a nutshell. An uncharacteristically speedily-written nutshell for this caffeine-addicted snail of a writer. I’m so buzzed off of them right now that I seriously need to take a breather and calm down. Uh-oh, the website for these small but mighty coffee bombs say they “last you all day.” Bzzzzzzz. I’d better get used to it.